← All Is Well? It’s Exceptionally Well in 2012! It was raining and dark, not the best of conditions, as I drove back from dropping off a friend at the airport. Visibility was not great and coupled with my mature night vision it required a lot of effort. It can be stressful as other cars are wheezing by, or riding so close because they were clueless about what I was contending with at that moment. They didn’t understand that the faster I would go the more impaired my distant vision became and the likelihood I would become overwhelmed would increased causing me to slow down even more. Needless to say, I did what I knew to do which was to pray. In an instance, I recalled what my one of sisters had told me. “Get behind a truck and coast behind it.” That is what I did. In the assurance of the remembrance, I was also directed which truck to get behind. There were myriad trucks out there and I could have gotten behind one that was racing down the freeway like a crazed maniac. But, I was guided to follow this one truck and in the quietness of God’s assurance, I knew that this truck would be the one to take me to a place of comfort. My apprehensiveness subsided as I focused my eyes on the back of that truck and coasted down the freeway. He maintained a comfortable speed as he was unaware that he had cargo behind him. As I followed behind him my vantage point was limited because all I could see was the back of his truck. As I followed closely behind him, the small still voice of God reassured me that this truck would take me straight to the point where I needed to turn off. Gradually I approached the turnoff point and maneuvered to get into the right lane. As soon as I was safely there, you guessed it, that truck eased right in front of me. We both turned off at the same point and approached a fork in the road where he went left and I went right. I never physically met the driver, but he guided me to a place of comfort and I could see my way clear. By that time, dawn was rearing its head just above the horizon. There are situations in our lives when you can’t stop moving even in the midst of anxiety. You are not going to know everything, but you do have to trust that God does. In His infiniteness, He is safely guiding and orchestrating your every move. Yes, you are going to be afraid, but you can’t stop moving forward. Pray, seek God’s direction as I did and follow them closely. Not only that, he will also connect you with someone who will help to move you further down your path. You may or may not know them, but trust God for those divine connections that propel you forward. 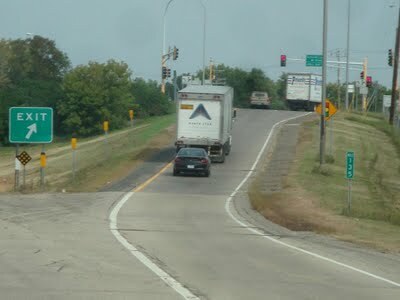 Interestingly, as I road behind that truck my trip back was a lot easier and faster than my trip going out. There are times when you need someone else to propel you forward because they have the necessary information for your success. Trusting in God requires blind faith. In essence, my vision was impaired. I was totally depended on the driver of the truck. You have to become so depended on God that you lose yourself as you seek and closely follow Him. Yes, especially in the curves of life and the darkest of circumstances. Peace encapsulated me as I drove behind that truck. It is that same serenity of peace you must have in following God. He will not steer you wrong. He will not cause you to move so fast that you become overwhelmed. Yes, He does guide you at a steady pace on your road to success. Posted on January 18, 2012, in Uncategorized. Bookmark the permalink. 4 Comments. This is a good example of trusting God when when you feel you are losing control af a situation. I have been there in many instances even while driving while experiencing an anxiety attack, all I could do was pray as ask that God give me peace and he did as I continued on my journey. Praise the Lord for His leading. When I read “Get Behind A Truck”, it took me back to a situation in the snow. We were traveling from the Eastern Shore during a winter snow storm and the vision was poor. We could not even see to the end of the bridge, but God allowed a truck to turn and get in front of us. It was very scary because we could not see much more than a one foot. Elder Barckley said he believed God allowed the truck to lead us across the bridge,we could not see but thank God He could see and made provision for safety.